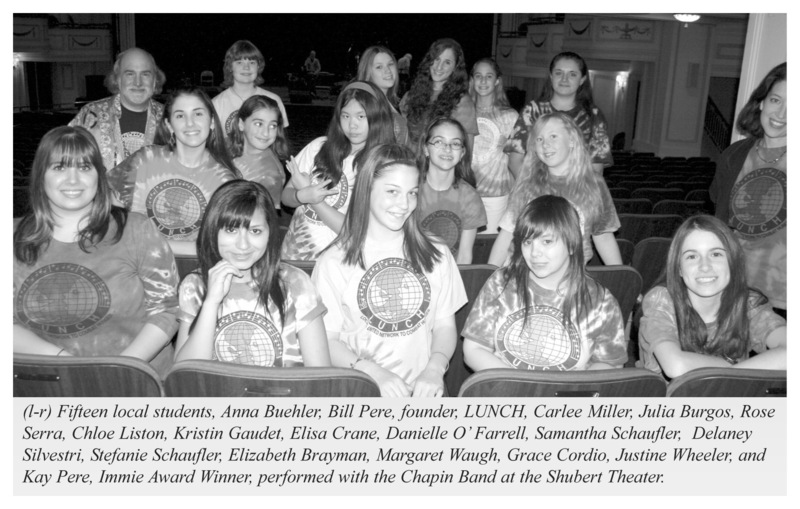 Fifteen local students, grades 5-12 attending schools in Westerly to East Lyme, joined with several professional artists to present a concert at the Shubert Theater in New Haven on May 9. The event, a tribute to the legacy of singer-songwriter Harry Chapin, featured the platinum recording artists of the original Harry Chapin Band (Steve Chapin, Big John Wallace, and Howard Fields), along with Mystic recording artist and one of CT’s Official State Troubadours, Bill Pere, and Immie Award Winner Kay Pere. The concert raised $20,000 for social programs along the Shoreline from New Haven to Westerly. At the show, Bill presented Steve Chapin and his son Jonathan with a $1,000 donation from Local United Network to Combat Hunger (LUNCH) to World Hunger Year, the organization started by Steve’s brother, Harry Chapin. The concert was organized by Bill Pere, founder, LUNCH. LUNCH uses the power of popular music to produce positive social action. Bill says “We involve kids in our shows to show them they can make a difference in the lives of others.” The LUNCH website is www.lunchensemble.com.